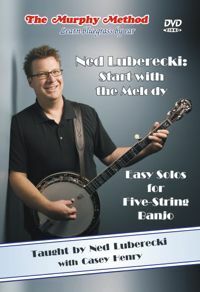 Ned Luberecki: Start With The Melody - Easy Solos for Five-String Banjo - The Murphy Method welcomes Ned Luberecki to our roster of teachers. Ned has toured nationally and internationally with bands like Chris Jones and the Nightdrivers, the Rarely Herd, and Paul Adkins and the Borderline Band, and he's been teaching for over 25 years. We are proud to present his first ever banjo instructional DVD. Ned teaches six well-known songs, by ear, and then shows you how to add some fill-in notes, and rolls, and a couple licks, to create bluegrass-style banjo breaks. No Tab! © 2019 Arrandem Music Co. All rights reserved. Website design by Casey Henry.